What was first the egg or the chicken? This tricky question always reminds me of a story my mom told me: when I was a little girl (went to kindergarden), the teacher asked me: What’s the colour of white cow’s milk? And, of course, I said white. And then she asked, what’s the colour of the black cow’s milk? What do you think I answered? Black… of course! It was a logical thought :D Going back to chickens and eggs, this post will be about a hen’s recipe that became so hard that couldn’t be eaten. Even though I knew the book’s recipe was short on cooking time and I added one more hour… the hen was hard as a rock!!! That’s why I finally chose to repeat it with chicken. What sound do your chickens do? Here in Spain all chickens sing: Ki ki ri kiii. And also, another question: are a live and dead chicken named the same? Here the live one is called Gallo and the one we eat (dead) is called Pollo. But a hen is always called Gallina, no matter it’s dead or alive… weird ugh? This one was so dead, poor thing. I remember my parents raising chickens when we were kids in our country house and I remember my grandmother killing them so that they would go inside the casserole and one day… she didn’t hold the bird properly and after cutting it’s head the animal scaped and run a few meters… Aaaaahhhhh… she didn’t care at all! But my brother and I were soooooo impressed! Ingredients for 4 servings: 1 Hen (but, as I said, I used a chicken), 100 grs of ham (serrano in dices is fine), 1 glass of white dry wine, 10 toasted almonds, 2 boiled eggs, 2 spoon table of flour, 1 glass of chicken stock, 1 onion, 1 garlic clove, a bunch of herbs (use the ones you prefer) I used thyme, bay leaf and oregano, olive oil, salt, pepper, saffron and nutmeg. Clean the chicken and cut in 8 regular pieces. Dress with salt and pepper. 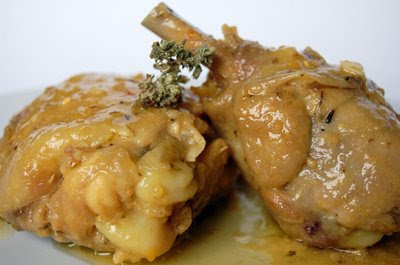 Take a big sauce pan and with some olive oil, fry the chicken pieces and when they start getting golden, add the ham, onion, garlic and the herbs. Cook until the onion gets transparent and then pour the flour, the wine and the stock. Dress with pepper, saffron (6 strings) and nutmeg (a pinch). Simmer until the chicken gets tender. It will take approximately 30 to 45 minutes. If your chicken is farm raised or wild it might take some more time. Boil the eggs and reserve. Meanwhile, smash the almonds, the egg yolks and some water in a mortar. Reserve. When the chicken is tender, add this mortar dressing to the sauce pan. Stir and cook for 5 more minutes. A super easy recipe with a wonderful flavour! Better to eat the day after of after a few hours. Serve hot. I’m ashamed and of myself! How could I be so dump? I don’t know where my credibility will go after this, but I had to tell you… they say that is wise to correct ones mistakes… but I don’t feel wise at all!!! I mentioned in my post that pollo is the dead chicken and gallo the alive one. Wrong!!!! Pollo is also a live chicken. We have pollo’s farms here and they are not dead! How didn’t I think of that? Aaahhhhh! You can throw some tomatoes to my face here! 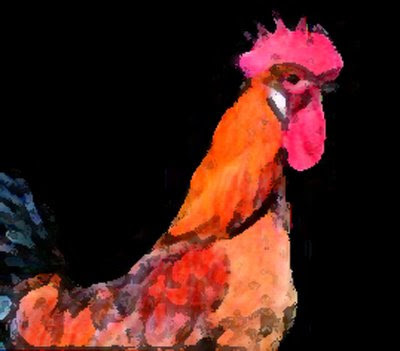 It’s called gallo, or rooster the poultry yard male of the chicken (Gallus gallus). This sauce looks to die for! Yum! We call chickens dead or alive, chickens. I was surprised to see the hard-boiled eggs and almonds went in the sauce. That must have made it very rich and delicious, indeed. Gracias for the espanol lesson Nuria! I’m glad it turned out tender for you the second time. That’s a wonderful sauce you accompanied it with! Sounds really rich I think the combination of spices you used is best :) Wow, so you just boil the eggs for the yolks? What do you do with the whites? Just eat them? First of all the dish is fantastic. Secondly, now I’m convinced I’ll never EVER learn to speak Spanish – if you call one chicken three different things depending on status I don’t even want to know how other things could be described. This looks like a great autumn dinner, too! Hola Jenn! Nice to see you back in my blog :D.
Your chickens speak such a weird language ;D. Thanks for the info darling. Nathan, thank God, I have a wonderful metabolism and I can eat more than normal and don’t get that fat… of course I ate the white of the egg with dressed with oil and salt ;D. Also I know there’s 0 calories in the white part! It’s amazing the use you give to eggs here in America. When I was a kid here in Spain, the pediatric doctor recommended only one egg per week and I know that in America the recommended average was 4!!! Hola Heather… we dedicate so much time to blogging and it’s so absorving that is great to step back from time to time. No news about the recipe contest? No, don’t stay that, not stupid at all. I would have loved to have some of this chicken. Ki kiri kiiiiiiii Nuria…here they chickens say kukuru kooooooooo!!! 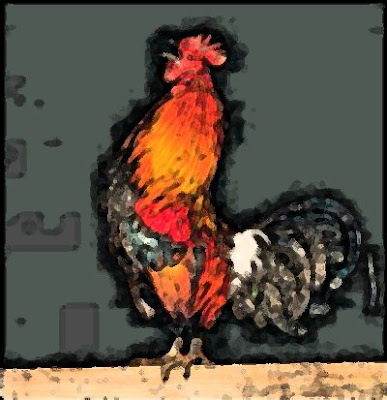 Love your logic & am so impressed with your gallo,pallo & hens & chickens…dead or alive are another matter! I don’t know my hen from my chicken…sorry, I thought they were all the same…*dumb* maybe, but I confess; live & learn. That chicken recipe does look tender & delicious! Hola & xoxoxo!! Nuria you are too funny; I can always count on your posts to bring a smile to my face. Not to mention the yummy food. 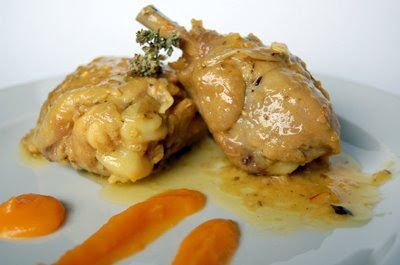 Beautiful chicken recipe, I’ve never used egg yolk in a sauce that way. I will have to try this soon. this is a fave of ours. we did our own version of it (totally not traditional) awhile ago on the blog. i didn’t realize that you smash the almonds along w/ the egg yolks. i thought many spaniards boil the eggs and roughly chop them up to sprinkle the pepitoria w/ that. just like everything else “traditional”, there prob. are a million different variations of the dish. i gotta say, yours looks really delish. i’m going to try it!! Haha, I love your funny stories. I woud be devastated if I witnessed a chicken being killed. Thanks so much Cynthia! The dish was good but my explanations… don’t feel proud about that. Hola Deeba :D. Isn’t it fun how chickens sing in the morning depending on where they live? ;D xoxoxo. Have a great day, darling! Hola Amy/Jonny! You are so true… there’s so many interpretations of one recipe… but as long as the result is yummy, I think it’s good :D. I’m sure your interpretation was marvelous too! Hola Emiline :D. I bet you would have been shocked too! My grandmother was made out of iron… she was such a tough woman! 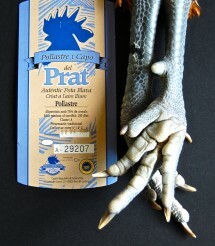 Info about gallo, pollo…..and the story sounds nice to me! I like ur writing style! Oh My God…there’s a Greek song about going to the market and the Greek chicken goes, “ki-ki-ree-kee-kee”! 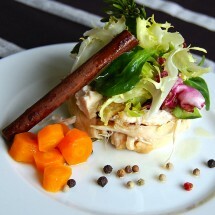 Chicken is the comfort food dish…as a main, for soup or sandwich. 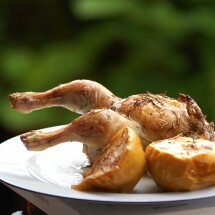 I have to try cooking my chicken in thsi style next.Looks wonderful. That is one lovely, lovely sauce and I’ll be trying that out pretty soon. What do you call delicious? Your chicken looks that delicious. Actually,”Gallo” in Spanish doesn’t refer to a “dead chicken” but to a “adult chicken”, dead or alive.